Mt Gravatt forms an inspiring backdrop for Showground events like last Sunday’s Green Heart Fair and the Showgrounds link our mountain heart with our community in a way unique in Brisbane and possibly the world. The Mt Gravatt Precinct Landscape Plan aims to build those community links as an integral part of the environmental restoration of this important and diverse Australian bush habitat only 10 kilometres from Brisbane CBD. The plan is based on our vision for the restoration of Mt Gravatt and complements the Mimosa Creek Precinct Landscape Plan. Pollinator Links, a key part of the Landscape Plan, will link Mt Gravatt Reserve with Bulimba Creek via the Showgrounds and Jo’s Creek. Pollinator Links are an innovative approach to creating wildlife corridors through the fragmented urban landscape. These urban ecological corridors will allow pollinators such as Sugarbag Stingless, Leafcutter and Blue-banded bees (all recorded on Mt Gravatt) to move between fragmented habitats. Birds like Grey Fantails and Golden Whistlers, butterflies like Orchard Swallowtails and Tailed Emperor will also utilise these pathways, thereby returning these species to our backyards. While the environment is the key focus building and maintaining long-term financial and community commitment requires creation of shared value through identification of business opportunities and community benefits derived from habitat restoration. 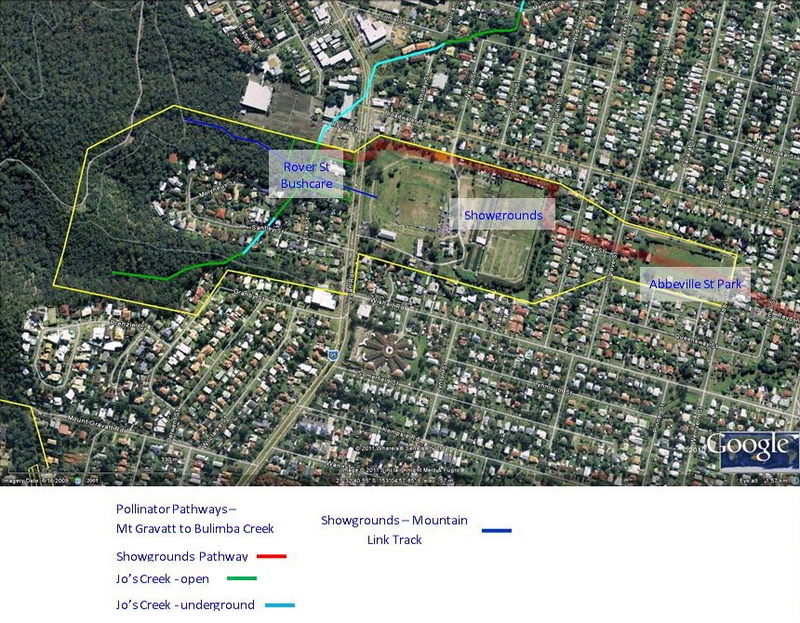 The Showgrounds – Mountain Link Track is one example of shared value creation – creating easier access to mountain walking tracks and opportunities for “King of the Mountain” type tourism events based at the Showgrounds.